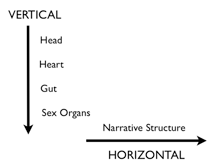 THE TWO AXES OF STORYTELLING -- In his book, "Don't Be Such a Scientist: Talking Substance in an Age of Style," Randy Olson broke storytelling down into what he calls "the two axes," meaning the Horizontal axis (narrative structure) and the Vertical axis (the humanizing of stories). He then partnered with actor/script consultant Dorie Barton to address the horizontal axis (narrative structure), and actor/improv instructor Brian Palermo to address the vertical axis (the need to move down from your head into your heart for emotion and gut for humor) through improv acting techniques. THE THREE INDIVIDUAL NOVELTIES - Each team member brings a singular major novel item to the storytelling process. Randy Olson has created the "And, But, Therefore" template as the narrative spine of what has been called "The Elevator Pitch," for over a decade but this is the first time it has been given a clear structural spine. Dorie Barton, drawing on her expertise as a Hollywood script consultant, has created a "Logline Maker," as an extension of the Elevator Pitch to delve into the protagonist-driven storytelling world of Hollywood. And Brian Palermo offers up improv exercises and techniques as a system for developing and enhancing "the human elements" of storytelling (emotion, humor, instinct, fear, etc.). THE SYNTHESIS - Together the team with their CONNECTION model of storytelling provide a system through which stories can be adapted, shaped and developed for practical use in everything from the courtroom to the campaign trail. The model can be used to develop your own personal story, the story of a person facing a conflict, the story of entire groups of people facing challenges, or "the narrative" of an organization or company.